In the end, three Republican senators—Maine's Susan Collins, Alaska's Lisa Murkowski and Arizona's John McCain—decided their party's bill to repeal the Affordable Care Act would be bad for the states they represent. 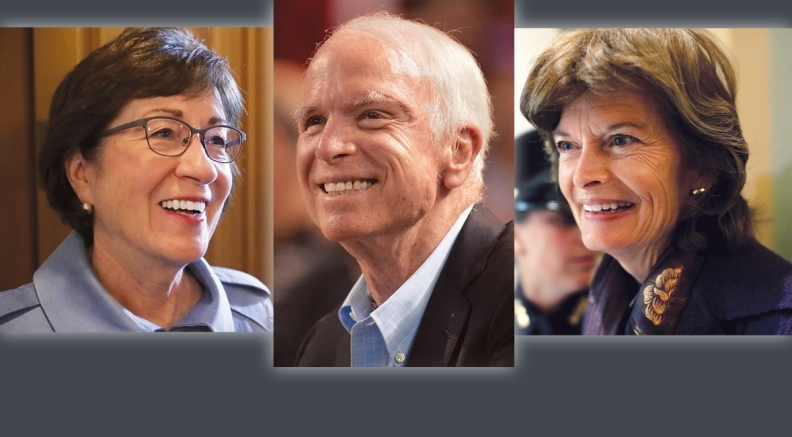 Resisting tremendous political pressure, the three voted against Senate Majority Leader Mitch McConnell's stripped-down ACA repeal bill. In doing so, they dramatically reshaped the epic political battle over the future of the ACA, which has been bitterly fought over by Republicans and Democrats since it was passed by Democrats on a party-line vote in March 2010. For their pivotal role in changing the direction of the debate, Modern Healthcare has selected the trio of veteran Republican lawmakers for the top spot in our ranking of the 100 Most Influential People in Healthcare for 2017. "They broke rank from partisanship and voted their conscience," said Bernard Tyson, CEO of Kaiser Permanente, who himself is ranked fourth on the list, immediately following the three senators. Tyson, like many health system leaders, was relieved that the GOP repeal effort failed. "It's my hope this will be a part of a healing process in which we come together in a bipartisan way to resolve big issues for the American people." The three senators did not respond to requests for an interview. For months, healthcare industry leaders and patient advocates had pleaded with congressional Republicans not to pass their repeal-and-replace legislation because it would slash Medicaid funding and roll back the law's coverage expansions. Some GOP lawmakers seemed to agree, voicing sharp criticisms of the legislation and of the rushed, secretive process by which it was written. The opposition efforts, however, fell short in the House, which in June passed a repeal-and-replace bill projected to increase the number of uninsured by 23 million. Still, healthcare groups were guardedly hopeful by late July that they had convinced as many as 10 Senate Republicans to oppose the Senate version. To pass, the bill needed 50 of 52 GOP lawmakers to vote yes since no Democrats supported it. It turned out far fewer than 10 Republicans were convinced. Collins and Murkowski, as expected, said no to McConnell's repeal bill in a tense post-midnight vote on July 28. Then McCain, arriving late, walked onto the Senate floor. He came up to Collins and Murkowski and told them, "You two are right." He ambled over to the Senate Clerk's desk, held out his right arm, paused and turned his thumb down to register his opposition. Of course, there were others who made large contributions to derailing the repeal legislation, including Senate Minority Leader Chuck Schumer; Republican governors such as Ohio's John Kasich and Nevada's Brian Sandoval; healthcare industry groups such as the American Hospital Association and the American Medical Association; and many grass-roots activists. But those efforts would have meant nothing without the three senators' no votes. Their action brought them widespread praise as heroes for preserving the ACA, and equally widespread condemnation as GOP traitors for blocking fulfillment of their party's seven-year promise to abolish the law. "Those were some of the bravest votes I've ever seen in politics," tweeted Sen. Angus King of Maine, an independent who caucuses with the Democrats and supports the ACA. FB01RMany Republicans disagreed. Sen. Ron Johnson (R-Wis.) suggested McCain's newly diagnosed brain tumor might have impaired his decisionmaking. President Donald Trump chided Murkowski, tweeting that she "really let the Republicans, and our country, down." Sen. Bill Cassidy (R-La. ), who voted for the repeal bill, agreed that the three senators were brave but hopes they'll come around to support a different repeal-and-replace bill. "Whether their vote was right or wrong, it takes courage to vote differently than everyone else on such an important issue," he said in an interview. "You have to do what you think is right, and they did." The collapse of the GOP-only repeal bill boosts the chances that the Senate will take up bipartisan legislation in September to stabilize the struggling individual insurance market that covers nearly 20 million Americans. Mike Leavitt, a former Republican Utah governor and HHS secretary who now heads consultancy Leavitt Partners, called the decision by the three GOP senators to block the repeal bill "highly significant" because it may nudge the Senate toward bipartisan action on a scaled-down healthcare bill. Sens. Lamar Alexander (R-Tenn.) and Patty Murray of Washington, the chairman and ranking Democrat on the Health, Education, Labor and Pensions Committee, respectively, have agreed to hold hearings and work together on a bill. That's precisely what Collins, Murkowski and McCain repeatedly had urged their colleagues to do. In a speech on the Senate floor July 25, McCain implored his colleagues to return to the traditional legislative process and craft a bill in the HELP Committee with contributions from both parties. The result, he said, is "something that will be imperfect, full of compromises and not very pleasing to implacable partisans on either side, but that might provide workable solutions to problems Americans are struggling with today." The no vote from Collins was not a surprise; she's always been a liberal-leaning Republican prone to stray from the conservative party line. She voiced particular concern about the GOP's proposal to slash Medicaid funding, which she feared would hurt disabled children, the poor, and rural hospitals and nursing homes. Earlier this month, Collins explained to CNN that the repeal bill's provision prohibiting Medicaid funding for Planned Parenthood's women's health services was a significant factor behind her and Murkowski's no votes. It was "inconsistent with our Republican ideals" to advocate for patients' freedom to choose their own healthcare providers—as long as the provider was not Planned Parenthood, she said. Murkowski had bucked the GOP establishment to win her seat through a write-in candidacy in 2010. She reportedly was infuriated when the Trump administration threatened to punish her state economically if she didn't support the healthcare bill. McConnell tried offering her a huge sweetener in the form of nearly $2 billion in extra healthcare funding for Alaska. But that didn't work either. McCain is famous for his maverick statements and actions defying GOP orthodoxy. His most passionate objection was to McConnell's closed-door process of crafting the bill. "You had three individuals who by their history and nature are quite independent," said Gail Wilensky, a health economist and senior fellow for the Project HOPE foundation who headed the Medicare agency in the George H.W. Bush administration. Collins and Murkowski had signaled their likely opposition for weeks, arguing the bill would cause many people in their states to lose health coverage, sharply reduce federal Medicaid funding and hurt access to women's healthcare services. But McCain's vote—coming days after his dramatic return to Washington after being diagnosed with brain cancer following eye surgery—was a last-minute shocker. While he previously had voiced concerns about how the legislation would affect coverage in his state, he never indicated he would oppose it. Just hours before the decisive vote, McCain suggested he would support the repeal bill if he had assurances from House GOP leaders that they would work with Senate leaders in conference to pass a fuller replacement package. He later said House leaders did not provide adequate assurances. "This was an extremely courageous thing for them to do," said Norman Ornstein, a political scientist at the American Enterprise Institute. "The other side of the coin, though, is when you look at the terrible quality of the bill, this reflects poorly on their colleagues, who should have done the same thing." In a CNN interview, Murkowski said she'll never forget what McCain told her and Collins right after the vote. "He said people might not appreciate what has happened right now as being a positive," she recalled. "But time will prove that having a pause . . . to do better is going to be good for the country." Ornstein said he worries that if the bipartisan effort to stabilize the insurance market dies, Republicans will return quickly to repeal-and-replace with a bill that, in his view, would be even worse than what they considered before. Then the pressure on the three senators to go along with McConnell will be that much greater, he predicted. Indeed, Cassidy said he plans to offer repeal-and-replace legislation next month that addresses the concerns of the three holdout senators about people in their states having healthcare. Cassidy expects it will be a GOP-only bill, because he doubts Democrats are willing to cooperate. So it likely won't meet the three senators' insistence on a more open and inclusive process. "You can't get there without at least two of those folks, and ideally you'd like all three," he said. There's no certainty what the three senators will do next on healthcare. But if the Senate takes up either a new repeal-and-replace bill or a narrower bill to stabilize the individual insurance market, their votes will remain critical. That means Collins, McCain and Murkowski soon may face another test of their resolve.